These interesting pumps have a long history dating back to its original design in Zimbabwe in 1933. Often referred to as the Zimbabwe Bush pump, early versions were built of components that required no welding. Large and clunky looking devices, these pumps feel clumsy and heavy compared to more modern hand pumps. This is, however, part of the beauty of these pumps. They are the “Sherman tanks” of hand pumps. They are durable and long-lasting. Built mostly of common plumbing parts, pipe, iron bar, angle iron, and common nuts, bolts, and washers; the Bush pump is an excellent candidate for local manufacture and maintenance. Perhaps the most identifiable component of the these pumps is the use of a large block of wood, drilled through, that serves as the bearing and lever mechanism at the heart of the above-ground parts. This block of wood is commonly soaked in oil to improve its bearing or bushing properties. 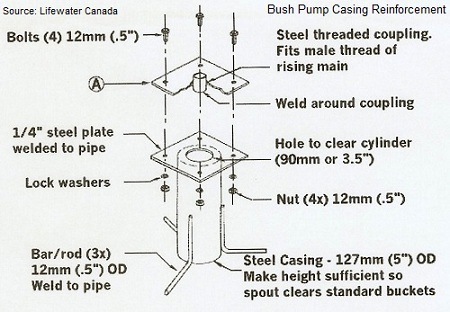 The Bush pump is an inexpensive and, as noted, easy to build pump, with parts readily available. Upon the independence of Zimbabwe, the government insisted on retaining its own national water hand pump. Since then, many versions of this pump have been built by NGO’s and other government departments. The original versions of the Zimbabwe Bush pump were closed-top cylinder pumps sometimes referred to as Murgatroyd pumps (after the original designer Tommy Murgatroyd). As with most other hand pumps that began life as closed-top cylinder pumps, development of an open-top design was pursued. In the Zimbabwe Bush pump, there are now three different cylinder types available, all made of brass with a brass piston and a brass foot valve. These pumps are available in 75mm (3 inch) open-top cylinder, 63.5mm (2 ½ inch) open-top cylinder, and 50mm (2 inch) closed-top cylinder designs. Riser main pipes are galvanized iron and pump rods are of mild steel. But in practice, below-ground parts can be from any type of pump. It is not unusual to find Bush Pump above-ground parts operating an Afridev cylinder or India Mark II or Mark III cylinder below ground. Although originally built in Zimbabwe, these pumps can be found in many areas of Africa. It continues to serve faithfully and dependably. Whatever version of Bush pump you may run across, its identity is unmistakable. They are easily identified by their distinctive above-ground construction. What makes these pumps so special is that they are rugged, cheap, easy to build, and reliable. One additional benefit is that, being constructed of inexpensive hardware, there is little incentive to vandalize or loot a pump head for resale. 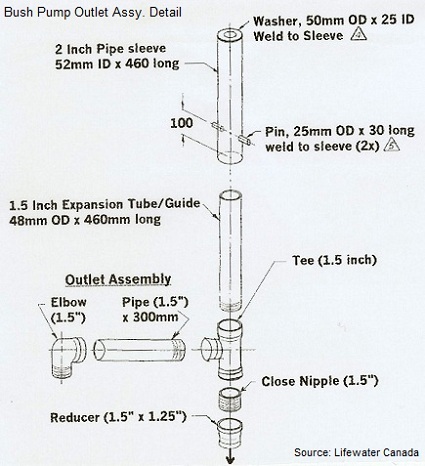 Common tools such as spanner wrenches, open end wrenches are used when working on such a simple pump. It is quite possible that a tripod with block and tackle would be required if galvanized riser main is to be pulled from the well. 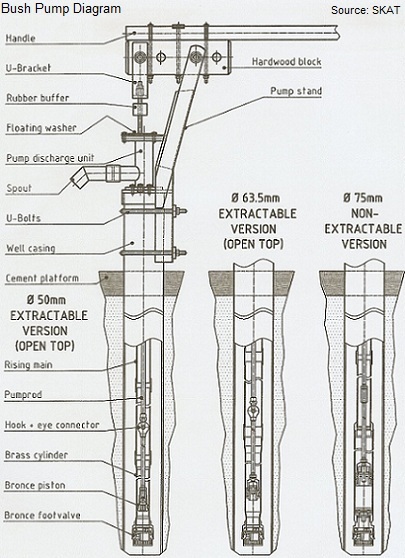 Below you will find exploded diagrams of the above-ground components of the Bush pump. These are intended for illustration only. Swiss Centre for Development Cooperation in Technology and Management (SKAT) publishes a Bush pump manual. There is also an Installation and Maintenance Manual available. 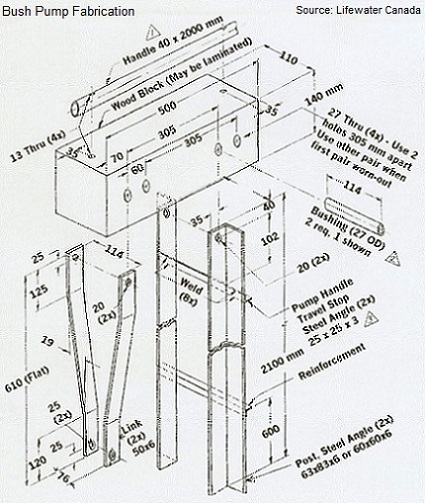 Return to "Introduction to Hand Pumps" from "Bush Pumps"